Why Am I Kissing a Dolphin? – Colleen Patrice, M.A. 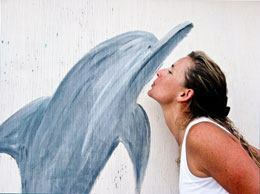 Blog Why Am I Kissing a Dolphin? Why Am I Kissing a Dolphin? Swimming with wild dolphins has been an incredibly healing presence in my life. My passion for dolphins began with a serendipitous swim off the coast of Southern California over 20 years ago. After my beloved sister committed suicide in 1992, my connection with these magnificent and playful creatures grew exponentially. I spent vacation after vacation traveling to places where the dolphins and I could nurture our friendship. Then one day I moved to The Bahamas and bought a company called Dolphinswim. For 2 years, I enjoyed my wildest dream… living on a magical island, working and swimming with wild dolphins, and sharing the experience with 100’s of people. While running Dolphinswim, I even met my Beloved Partner, Brett, and my chosen-mother Momma Sue, both of whom have blessed my life and my healing journey in the most amazing and beautiful ways. To me, the dolphins have always seemed like earth angels and a very-easy-to-see embodiment of God. With them, I had my first experience of being completely present in the moment, and a clear sense of at-one-ment with All That Is. I have seen abundant examples of how their presence brings healing to the heart, joy to the spirit, and a “remembering” of Who We Truly Are to the mind. You are such a wizard with words…your grace & love comes thru always. Congrats on your new book: Lighten Your Toxic Load…can’t wait to read it!